Staghorn Sumac, Rhus typhina, Anacardiaceae, part of a rather infamous plant family. Staghorn Sumac in winter, with its distinctively persistent fruits. We all have family members who are a bit less ‘appropriate’ than others. They are the ones that fascinate the younger folk, and who inevitably provoke widened eyes and comments like “oh god, now what are they doing …”. Well, perhaps Sumac feels about some of its cousins. Poison ivy, poison sumac, and poison oak are all in the same family. These vine-y creatures can cause a fantastic amount of itchiness and discomfort, mainly through the production of an oil called urishiol. But more on that in my upcoming article on poison ivy:). The raucous cousin of Staghorn Sumac, Toxicodendron radicans, also known as Poison Ivy. Along with poison sumac and poison oak, these family members rub many folks the wrong way. The oil urushiol is mainly responsible for this, and though far more concentrated in the above species, some other members do contain small amounts of this itch-making substance. Mango fruit, a more popular member of the Anacardiaceae family. 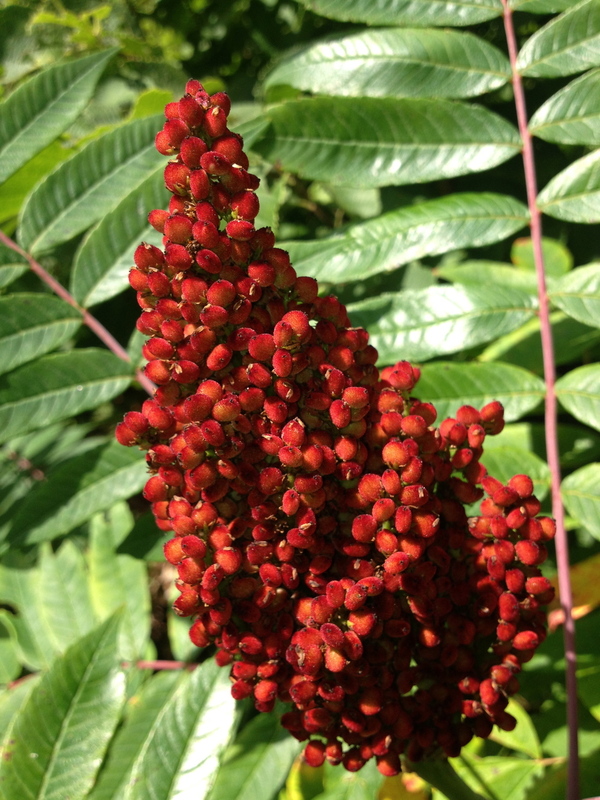 A sweet fruit, it also has a hint of sour, similar to our Staghorn sumac. In fact, staghorn and other types of edible sumac often get a bad rap just for having a similar name (“oh, you're part of that family…”). But to balance out those rather rowdy relatives are some rather delightfully edible plants. Cashews and mango are both in this family, as well as pistachios. The distinctive fuzz-covered branch tip that gives Staghorn Sumac it's name (that soft texture was thought to look similar to deers antlers in velvet). It also helps distinguish staghorn sumac from another common species, Rhus glabra (glabrous = smooth in botanical geek-speak:). The common name of this plant comes not from its showy fruits, but from it’s subtly fuzzy branches. Before the first leaves are even on this shrubby tree, it comes out with simple branches of a velvety texture similar to the newly grown antlers of a deer. Up close and personal with the fuzzy fruits of Rhus typhina, staghorn sumac. These are technically drupes, fleshy fruits with stony pits covering their seeds (cherries, peaches, and apricots are also drupes). Other notable characteristics of staghorn sumac are it’s pinnate leaves (pinnate = feather-like), and pithy stalks. In this case, pithy refers not to a succinct bit of repartee, but rather to the substance that fills up sumac stems. You’ll find pith in many non-woody plants actually. It plays a major role in nutrient transport and storage. The distinctive leaves of staghorn sumac. Their pinnate nature makes them appear oddly tropical, as though a palm tree has decided to send some of it's leaves north. Also note the pinky-purple mid-stem, another characteristic most obvious in the younger leaves. The pithy stalk of staghorn sumac, with a bit picked out for closer observation. The spongy white pith in here acts both as both storage unit and transportation, providing nutrients to the whole plant. For more on the tea, as well as when and where to pick this Seuss-ian beauty, check out our next post. Should give you plenty of time to find the nearest patch of these neat little things!